The relatively recent spread of Zika virus (ZIKV) in the absence of any available treatment or preventative vaccine has illustrated the need to better understand a number of issues associated with this previously understudied virus ranging from epidemiology, disease pathogenesis, and host immune responses. CD8+ T cell immune responses seem to play an important role in ZIKV-specific protective immunity, contributing to protective immunity against ZIKV. Dengue virus (DENV)–pre-exposed CD8+ T cells are also able to mount cross-protective responses against ZIKV challenge (1, 2). In this context, it is important to study and define the features of ZIKV-specific CD8+ T cell responses and ascertain whether these responses are fully functional or somehow altered (especially in DENV–pre-exposed donors), raising the possibility that these responses may be associated with immunopathology. 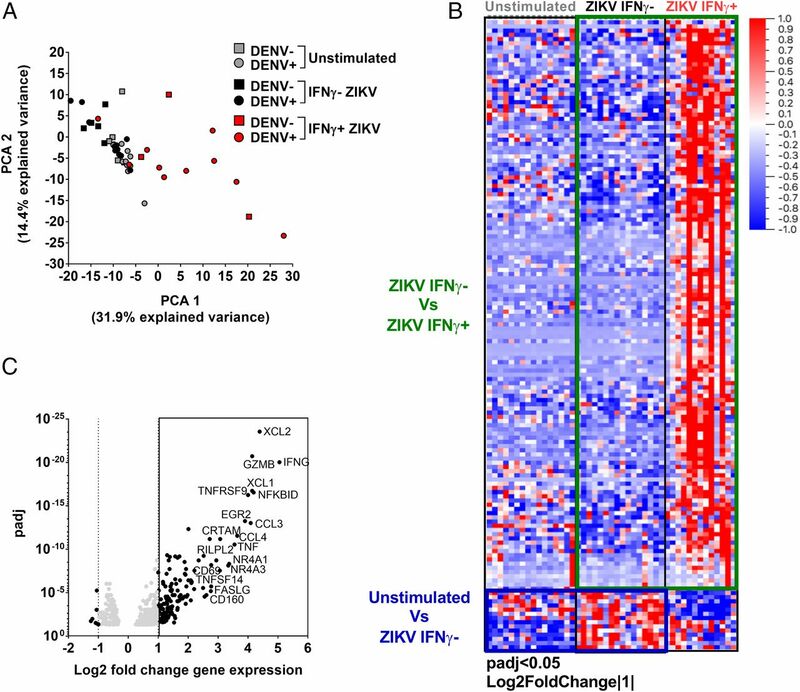 We previously showed that subjects characterized by prior DENV infection displayed not only increased magnitude of ZIKV responses in the acute phase but also showed a skewed immunodominance pattern of responses toward nonstructural proteins as previously observed in the context of DENV infection (3, 4). However, an in-depth characterization of the functionality of ZIKV-specific CD8+ T cell responses is not available to date. Blood donations from convalescent donors previously infected with ZIKV were collected (4) in Puerto Rico within the Recipient Epidemiology and Donor Evaluation Study-III or at the University of North Carolina (UNC Institutional Review Board no. 08-0895) and University of Miami from United States travelers with Zika symptoms. An additional cohort was identified at the Universidad del Norte in Barranquilla, Colombia. ZIKV infection was confirmed using RT-PCR during the early acute/symptomatic phase (5). Clinical and serological characteristics are summarized in Supplemental Table I. In addition to positive RT-PCR, previous ZIKV infections in convalescent phase samples were also confirmed using ZIKV neutralization assays, depleting DENV cross-reactive Abs (6). PBMCs were isolated (3), cryopreserved, and stored in liquid nitrogen until usage. DENV seropositivity was determined by DENV IgG or an inhibition ELISA (7, 8). Cells were stimulated with ZIKV peptide pools (4). Additionally, we used 309 ZIKV 9-mers and 10-mers corresponding to previously identified epitopes supplemented with predicted epitopes based on a 27-allele method (9) using TepiTool, available in the Immune Epitope Database and Analysis Resource (www.IEDB.org) (10). IFN-γ–producing cells were captured using a cytokine secretion assay (Miltenyi Biotech, Bergisch Gladbach, Germany) (11). Sorting gating strategy is shown in Supplemental Fig. 1. For the intracellular cytokine staining, PBMCs were cultured 6 h with 1 μg/ml peptide pools and BD GolgiPlug (BD Biosciences, San Diego, CA), then permeabilized, stained, and analyzed using FlowJo software (4). Supplemental Table II shows the Abs used for sorting and flow cytometry experiments. Two hundred cells for each condition were collected. To generate full-length transcriptomes from the low cells per sample, we adapted the Smart-Seq2 protocol (12). Bioinformatics analysis to obtain the raw counts and differentially expressed genes were performed as previously described (13). We considered genes to be differentially expressed with an adjusted p value of <0.05 and the log2 fold change in gene expression >1. Only genes with an average transcript per million (TPM) count ≥10 in ZIKV IFN-γ+ condition have been considered for further analysis. Principal component analysis (PCA) was performed on the top 500 most variable genes using versust transformation and the “prcomp” function in R, setting “scale” equal to TRUE. The heatmap was generated on versust-transforming data using Qlucore. Statistical analyses for FACS experiments were performed using Prism 7 (GraphPad Software, San Diego, CA). One-tailed Mann–Whitney or Wilcoxon tests were applied when appropriate. The data have been deposited in the Gene Expression Omnibus (GSE105884, http://www.ncbi.nlm.nih.gov/geo/) and ImmPort (SDY903, http://www.immport.org). To examine the nature of CD8+ T cell responses recognizing ZIKV epitopes, we performed a transcriptomic analysis of PBMCs from ZIKV-infected donors collected at the convalescent phase. In this study, PBMCs were stimulated ex vivo with ZIKV-specific peptide pools, and Ag-specific CD8+ T cells were sorted based on their ability to produce IFN-γ. The patients’ CD8+ T cells that did not produce IFN-γ in response to epitope stimulation from these same cultures as well as total unstimulated CD8+ T cells were also collected for comparison with their ZIKV-specific IFN-γ–producing CD8+ T cells. After sorting, microscaled RNA sequence determinations were performed on low cell numbers (12). We then analyzed the global gene expression patterns using PCA of the 500 most variable genes obtained after RNA sequencing (Fig. 1A). Unstimulated and ZIKV-stimulated IFN-γ− CD8+ T cells clustered together and were clearly separated from the gene expression profiles of the ZIKV-stimulated IFN-γ+ CD8+ T cells. This suggested that the main component of human CD8+ T cell response to ZIKV epitopes were from their IFN-γ– producing cells, in agreement with previous studies on both ZIKV and the closely related DENV regarding CD8 responses (1, 3, 4, 14, 15). The IFN-γ− CD8+ T cells may also include some, if not many, ZIKV-specific T cells, which did not secrete IFN-γ but instead secreted IL-2 or TNF-α under the stimulation of peptides. Further experiments targeting cell subpopulations secreting other cytokines or selected on the basis of specific activation markers could be performed in the future to broaden the characterization of ZIKV-specific CD8+ T cell responses. Gene expression analysis of ZIKV-specific CD8+ T cells. (A) PCA of unstimulated IFN-γ− (gray) and ZIKV-stimulated IFN-γ− (black) and IFN-γ+ (red). DENV pre-exposed (circles) and DENV naive (square) are also shown (B). Heatmap of differentially expressed genes after comparison of IFN-γ− and IFN-γ+ cells stimulated with ZIKV pools. (C) Differentially expressed genes based on adjusted p value and log2 fold change gene expression. Genes with log2 fold change >2 are highlighted. The interplay between ZIKV and DENV is an important issue because ZIKV and DENV not only share a high level of protein sequence homology but are also transmitted by the same mosquitoes, and ZIKV transmission has predominantly occurred in DENV-endemic areas (16). We have previously shown that prior DENV exposure modulates ZIKV responses when comparing acute samples that were DENV naive or previously exposed (4). In this study, we do not observe differences both in terms of frequency of IFN-γ+ cells of DENV seronegative and seropositive (Supplemental Fig. 1B) as well as in terms of gene expression observed (Fig. 1A), suggesting that DENV pre-exposure might affect ZIKV CD8+ T cells only during the acute phase of the infection. These preliminary findings should be further explored; however, they are in agreement with previous work in which small differences in monocyte gene expression profiles were observed in patients who had ZIKV or DENV infections, suggesting similarities between the two viral infections at the gene expression level (17). To identify gene expression patterns associated with ZIKV-specific CD8+ T cell responses, we determined the differential gene expression profiles of the patients’ IFN-γ− and IFN-γ+ cells after ZIKV peptide pools stimulation and on IFN-γ− cells that were unstimulated or stimulated with ZIKV (Fig. 1B). Overall, a total of 153 genes were differentially expressed in either one of these two analyses. Of these, 142 genes were upregulated at least 2-fold in the IFN-γ+ compared with the IFN-γ− ZIKV-stimulated cells, and 32 genes were differentially upregulated at a more stringent cutoff of a 4-fold level in IFN-γ+ compared with IFN-γ− cells (Fig. 1C). These results further emphasize that the main component of CD8+ responses to ZIKV peptides were the IFN-γ–producing cells (4). Next, we more closely inspected the mRNA sequence profiles of the IFN-γ+ CD8+ T cells to ascertain which genes at a more stringent 4-fold change cutoff were upregulated in the ZIKV-specific CD8+ T cells (Fig. 1C). Interestingly, among the most significantly upregulated genes were those encoding granzyme B (GZMB) and cytotoxic and regulatory T cell molecule (CRTAM), implying that the CD8 responses were not limited to cytokine release but were also associated with the hallmarks of a cytotoxic response (18). Among the other strongly upregulated genes were those associated with cellular activation, such as tumor necrosis receptor superfamily member 9 (TNFRSF9), which encodes the CD137 protein (also known as 4-1BB), important in priming and promoting CD8+ T cell effector and memory functions in the context of viral infection (19), and CD69, which encodes an important marker of T cell activation. In addition, significant upregulation was also noted for NFKBID, which encodes an NF known to be involved in homeostasis of the immune system that is activated after TCR stimulation (20). Other upregulated genes that correlated with activation were TNF ligand superfamily member 6/Fas ligand gene (TNFL6/FASLG) and member 14 (TNFSF14/CD258), which encode proteins involved in cytotoxic T cell apoptotic processes and immune regulation, and ERG2, encoding an upstream regulator of effector CD4+ and CD8+ T cells linked with protective responses and limiting immunopathology (21) as well as with regulating CD8+ T cell activation (22). Other prominently upregulated genes were X-C motif chemokine ligand 1 and 2 (XCL1 and XCL2), which encode chemokines with inflammatory function that are known to induce leukocyte migration and activation (23). The genes encoding the chemokine (C-C motif) ligand 3 and 4 (CCL3 and CCL4) proteins, associated with inflammation and in the case of CCL3 also with CD8 effector function, were also upregulated (24). Based on the gene function described above and available in UniProt knowledgebase database (https://www.uniprot.org/), we functionally grouped together the genes more strongly upregulated in ZIKV-specific CD8+ T cell genes into five main groups: 1) polyfunctional cytokines, 2) cytotoxicity, 3) T cell activation and regulation, 4) proinflammation, and 5) T cell homing. 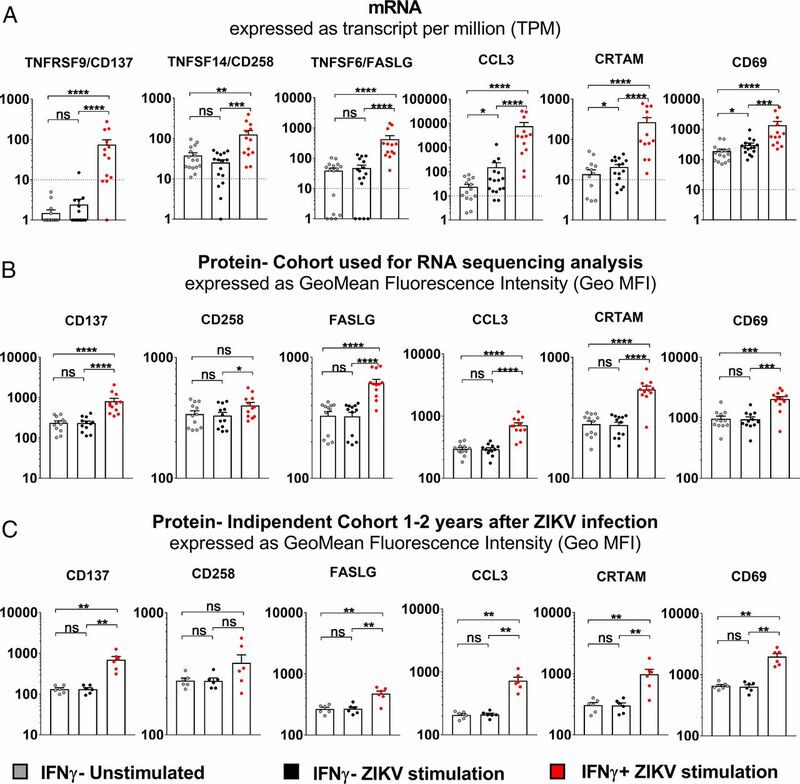 We previously reported, using a different cohort of donors/samples, that ZIKV-specific CD8+ T cell responses were characterized by IFN-γ, TNF-α, and GZMB release (4). We then compared the geometric mean of fluorescence intensity expression of IFN-γ, TNF-α, and GZMB in IFN-γ− and IFN-γ+ cell groups, reanalyzing our previously published data (4) (Supplemental Fig. 2B, 2D, 2F), to the TPM count originated by the mRNA sequence determinations performed in the current study. All genes (IFN-γ, TNF-α, and GZMB) encoding the proteins found to be upregulated by FACS analysis in previous studies were also found to be upregulated at the mRNA level in this study (Supplemental Fig. 2C, 2E, 2G). To further validate the CD8+ T cell ZIKV signature obtained by the mRNA sequence determinations and analyses, we selected six additional proteins (CD137, CD258, FASLG, CCL3, CRTAM, and CD69) based on differential expression of their corresponding genes (changes of >4-fold, p-adjusted values <0.05) (Fig. 1C) and the availability of a suitable commercial mAb to detect them. The protein-level expression of these markers was determined on a set of 12 donors known to respond to stimulation with ZIKV peptides, as previously reported (4), after a 6-h stimulation period with ZIKV-specific pooled peptides and intracellular staining. Overall, there was a good correlation between upregulation at the mRNA (Fig. 2A) and protein (Fig. 2B) expression levels. Our results demonstrated that the CD8+ T cell responses recognizing ZIKV-specific epitopes were prevalently associated with IFN-γ+ cells, as expected from our experimental strategy, and that this response appeared to be fully functional, as demonstrated by the upregulation of genes involved in cytotoxicity, chemotaxis, and inflammation. To prove that these observations were generally applicable regardless of the particular cohort analyzed or the time elapsed postinfection, we also analyzed the same markers on PBMCs from a different cohort in Barranquilla (Colombia) that had been collected 1–2 y after ZIKV infection. This independent ZIKV cohort showed patterns of protein upregulation remarkably similar to those detected in the previous cohort (Fig. 2C). These data, therefore, demonstrated that this expression signature was both reproducible and temporally stable after Ag-specific stimulation even 1–2 y after ZIKV infection. In summary, we report, to our knowledge, the first human immune profile of CD8+ T cells after ZIKV Ag-specific stimulation. Our data show that ZIKV-specific CD8+ T cell responses were predominantly associated with IFN-γ responses and that their gene expression signatures were further associated with cytokine polyfunctionality and cytotoxic activity. These common features were independent of DENV pre-exposure, geographical location, or time of sample collection postinfection and were identified both at the mRNA and protein level, therefore making these suitable candidates to be evaluated in cellular vaccine-induced immune responses. Because of the small volume of samples available, we focused our study on immune profiling of ZIKV-specific CD8+T cells. Future studies will address the immune profiles of human ZIKV–specific CD4+ T cells and compare the functionalities of CD4+ T cells with the ones of CD8+ T cells. Indeed, recent studies in humans and mouse models have shown the importance of ZIKV-specific CD4+ T cells in protecting from severe ZIKV severe and Ab development (25–27). Additionally, it would be of interest to test whether disease severity during the acute phase impacts the gene transcription and protein expression in ZIKV-specific T cells. However, the cohorts studied in this study were mostly characterized by a mild form of ZIKV disease and, therefore, this analysis could not be performed based on the current cohort. In conclusion, the current study represents a baseline for comparison between different clinical outcomes of ZIKV infection in the CD8+ T cell context. Correlation of expression at the mRNA and protein levels in CD8+ T cells of selected markers. (A) TPM for CD137, CD258, FASLG, CCL3, CRTAM, and CD69 genes. (B and C) Geometric mean of fluorescence intensity for intracellular protein level determinations (B). ZIKV-independent cohort collected 1–2 y postinfection (C). *p < 0.05, **p < 0.01, ***p < 0.001, ****p < 0.0001. We thank Sheridan Martini for sample coordination, Ashmitaa Loganda and Jason Greenbaum of the Bionformatic Core, and Denise Hinz and Cheryl Kim of the Flow Cytometry Core at the La Jolla Institute for Allergy and Immunology. This work was supported by National Institutes of Health (NIH) Contracts HHSN272200900042C and HHSN27220140045C, and Grants U19 AI118626-01 to A.S., HHSN268201100001I to M.B., and S10OD016262 to P.V. Further support was provided by the Zika Preparedness Latin American Network, which has received funding from the European Union’s Horizon 2020 research and innovation program under Grant Agreement 734584. Blood donor samples from Puerto Rico and Florida were collected as part of the National Heart, Lung, and Blood Institute Recipient Epidemiology and Donor Evaluation Study-III. The La Jolla Institute for Allergy and Immunology's FACSAria II cell sorter was acquired through Shared Instrumentation Grant Program S10 RR027366. The Illumina HiSeq 2500 Sequencer was purchased through NIH S10OD016262.
. 2017. Mapping and role of the CD8+ T cell response during primary Zika virus infection in mice. Cell Host Microbe 21: 35–46.
. 2017. Dengue virus-reactive CD8+ T cells mediate cross-protection against subsequent Zika virus challenge. Nat. Commun. 8: 1459.
. 2013. Comprehensive analysis of dengue virus-specific responses supports an HLA-linked protective role for CD8+ T cells. Proc. Natl. Acad. Sci. USA 110: E2046–E2053.
. 2017 Prior dengue virus exposure shapes T cell immunity to Zika virus in humans. J. Virol. DOI: 10.1128/JVI.01469-17.
. 2016. Single-reaction multiplex reverse transcription PCR for detection of Zika, chikungunya, and dengue viruses. Emerg. Infect. Dis. 22: 1295–1297.
. 2017. Lack of durable cross-neutralizing antibodies against Zika virus from dengue virus infection. Emerg. Infect. Dis. 23: 773–781.
. 2009. Severe dengue epidemics in Sri Lanka, 2003-2006. Emerg. Infect. Dis. 15: 192–199.
. 1990. Serological diagnosis of dengue by an ELISA inhibition method (EIM). Mem. Inst. Oswaldo Cruz 85: 347–351.
. 2013. HLA class I alleles are associated with peptide-binding repertoires of different size, affinity, and immunogenicity. J. Immunol. 191: 5831–5839.
. 2016. TepiTool: a pipeline for computational prediction of T cell epitope candidates. Curr. Protoc. Immunol. 114: 18.19.1–18.19.24.
. 2016. Lack of allergy to timothy grass pollen is not a passive phenomenon but associated with the allergen-specific modulation of immune reactivity. Clin. Exp. Allergy 46: 705–719.
. 2018. A sensitive and integrated approach to profile messenger RNA from samples with low cell numbers. Methods Mol. Biol. 1799: 275–301.
. 2017. Unique phenotypes and clonal expansions of human CD4 effector memory T cells re-expressing CD45RA. Nat. Commun. 8: 1473.
. 2018. Longitudinal study of cellular and systemic cytokine signatures to define the dynamics of a balanced immune environment during disease manifestation in Zika virus-infected patients. J. Infect. Dis. 218: 814–824.
. 2016. Immunodominant dengue virus-specific CD8+ T cell responses are associated with a memory PD-1+ phenotype. J. Virol. 90: 4771–4779.
. 2017. Situation report: Zika virus microcephaly Guillain-Barré syndrome. Available at: http://apps.who.int/iris/bitstream/handle/10665/253604/zikasitrep20Jan17-eng.pdf;jsessionid=64AF3C2F78E08372CD2E090CC063A504?sequence=1. Accessed: January 20, 2017.
. 2017. CD14+CD16+ monocytes are the main target of Zika virus infection in peripheral blood mononuclear cells in a paediatric study in Nicaragua. Nat. Microbiol. 2: 1462–1470.
. 2009. CRTAM confers late-stage activation of CD8+ T cells to regulate retention within lymph node. J. Immunol. 183: 4220–4228.
. 2014. CD137 expression is induced by Epstein-Barr virus infection through LMP1 in T or NK cells and mediates survival promoting signals. PLoS One 9: e112564.
. 2013. Atypical IκB proteins - nuclear modulators of NF-κB signaling. Cell Commun. Signal. 11: 23.
. 2017. Egr2 and 3 control adaptive immune responses by temporally uncoupling expansion from T cell differentiation. J. Exp. Med. 214: 1787–1808.
. 1998. LIGHT, a new member of the TNF superfamily, and lymphotoxin alpha are ligands for herpesvirus entry mediator. Immunity 8: 21–30.
. 2012. XCL1 and XCR1 in the immune system. Microbes Infect. 14: 262–267.
. 2003. CC chemokine ligand 3 (CCL3) regulates CD8(+)-T-cell effector function and migration following viral infection. J. Virol. 77: 4004–4014.
. 2018. CD4+T cells mediate protection against Zika associated severe disease in a mouse model of infection. PLoS Pathog. 14: e1007237.
. 2018. Critical role of CD4+ T cells and IFNγ signaling in antibody-mediated resistance to Zika virus infection. Nat. Commun. 9: 3136.
. 2018. Structural influence on the dominance of virus-specific CD4 T cell epitopes in Zika virus infection. [Published erratum appears in 2018 Front Immunol. 9: 2083.] Front. Immunol. 9: 1196.